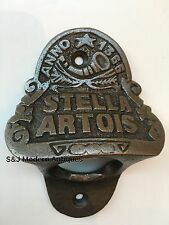 A FANTASTIC ANTIQUE STYLE BOTTLE OPENER. PERFECT FOR WALL OR BAR MOUNTING. Retro Cast Iron OPEN HERE Wall Mounted Bottle Cap Opener Bar Kitchen Beer uk Description description new cast iron beer bottle openers It measures 3 inches long, 2 ½ inches wide and 1 inches tall it has a rustic brown finish which makes it look vintage Each bottle opener has “OPEN HERE” in raised letters with an arrow indicating to where the bottle should be placed These can be mounted using two screws Great for home bars, beer coolers, kitchen or your man cave comes with 2 screws fitting --- CHROME STAINLESS STEEL FLEXIBLE BATHROOM BATH SHOWER HEAD HOSE PIPE WASHERS GBP 3.49 Buy it now --- Speed Out Screw Extractor Drill Bits 4 PCS Tool Set Broken Damaged Bolt Remover GBP 2.49 Buy it now --- Real Techniques 3-pc Duo-Fiber Collection Makeup Brush Set GBP 6. This is the classic wall mounted Peaky blinders bottle cap remover. 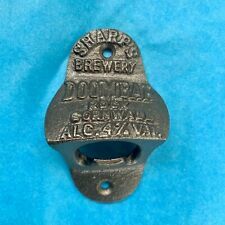 A DOOM BAR Design Wall or Bar Mounted Bottle Opener. Equally lovely on an inside Bar or Kitchen Cabinet, Man Cave! CAST IRON BOTTLE OPENER. HANDY SMALL OPENER. AMAZING QUALITY. Approx: length of opener 3½" (89mm). I HAVE OTHER BOTTLE OPENERS CURRENTLY LISTED. Condition / Defects. Bottle Opener Hand Held Volkswagen Cast Antique Iron. Made From Solid Cast Iron With a Clear Lacquer Finish so it will not rust. Perfect For Wall or Bar Mounting. 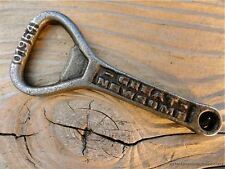 VINTAGE - CAST IRON BOTTLE OPENER - THWAITES . Thwaites Brewery is a regional brewery owned by founded in 1807 by Daniel Thwaites in Blackburn, Lancashire, England. Founder : Daniel Thwaites. Approx: length of opener 3½" (87mm). I HAVE OTHER BOTTLE OPENERS CURRENTLY LISTED. Condition / Defects. 5 x Beauty Foundation blending Makeup Sponge Flawless Buffer Puff. 8 x Beauty Foundation blending Makeup Sponge Flawless Buffer Puff Multi. Portable Mini UV Ultra LED Zoom Flashlight Violet Purple Blacklight Torch Lamp. Type B French cast iron bottle opener advertising GDE SOURCE / VITTEL Approx 81mm long, very good condition. Japanese cast iron bottle opener. Approx 83mm long. Good condition as shown in photo`s. Approx: length of opener 3¼" (83mm). I HAVE OTHER BOTTLE OPENERS CURRENTLY LISTED. Condition / Defects. Marked BARNETT & FOSTER on one side and LONDON on the other. Approx: length of opener 3¾" (97mm). I HAVE OTHER BOTTLE OPENERS CURRENTLY LISTED. Condition / Defects. 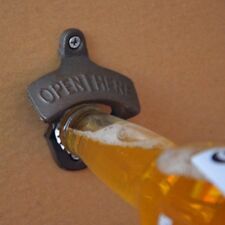 Wall mounted beer opener, perfect opener for most bottles. Material: Cast iron. Due to light and screen difference, the item's color may be slightly different from the pictures. Detail Image. Color: Black. PEAKY BLINDERS. CAST IRON BOTTLE OPENER. HANDY SMALL OPENER. VINTAGE CAST IRON BOTTLE OPENER KEYRING ANTIQUE STYLE.Great vintage keyring bottle opener reproduced from an original pattern in solid Cast Iron & lacquered for a lovely finish. This particular bottle opener design is one of the earliest designs in recorded history and dates back to 1923. This has been found due to the RD(registered} Number displayed - RD. 702661 Any queries please do not hesitate to contact me.happy bidding Dispatched with Royal Mail 1st Class. CAST IRON BOTTLE OPENER. HANDY SMALL OPENER. Cast Iron Coca-Cola Bottle Opener These are not genuine antique pieces. This listing is for ONE bottle opener only! 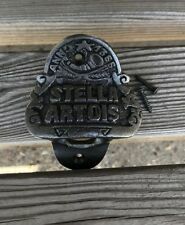 A LOVELY REPLICA OF A BOTTLE OPENER. MADE FROM CAST IRON.9CMS LONG AND 3.8CMS WIDE. IDEAL OPENER TO ADD TO YOUR COLLECTION. This model mounts to the wall with three screws (not included) and is perfect for indoor use or for a garden or patio wall. A cast-iron wall-mounted Bear Bottle Opener sports a hand-painted. finish of an attractive rust lifelike bear colour, the bear's mouth conveniently open. Made of iron, and probably nickel plated. It has an atmosphere of 60's to 70's Japanese engraving "Kirin Beer" & "Kirin Lemon". Nice to keep around fridge or very handy using as a key ring. Keys in picture are not included, the price is for one item. Bottle Opener. Steel Golf Club Iron. I always try my best to help. Bottle Opener Cast Iron 'Railway' Spike. Heavy quality bottle opener made of cast iron. Ansell's bottle opener. 88mm. 24g. Clean - No rust. Marked - SOUTH WEST N M W BOURNEMOUTH. Newcastle Blue Star Ales & Crown Cork. 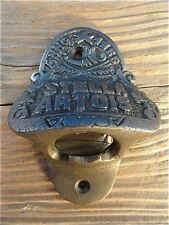 ANTIQUE LOOK CAST IRON BOTTLE OPENER.